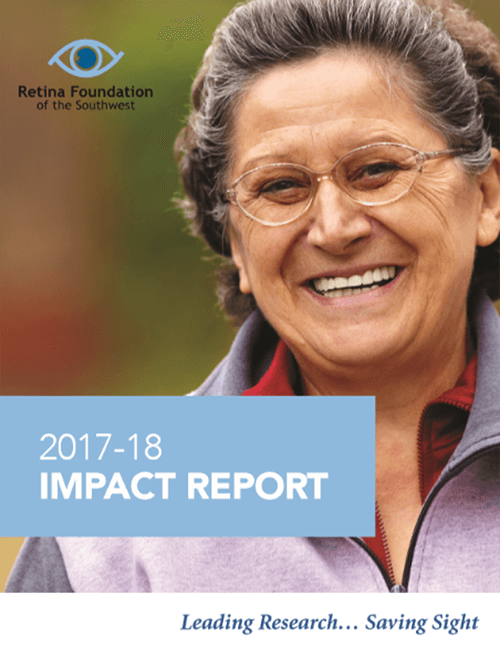 The Retina Foundation of the Southwest is making a difference in the lives of children and adults living with devastating eye diseases and conditions. We have five laboratories participating in more than 35 clinical research studies and providing more than 2,300 vision assessments each year completely free of charge. Our evaluations are unique because many of our testing methods are only available at our facility in Dallas, Texas. Patients are referred by local ophthalmologists to help in the diagnosis and treatment of their vision loss. Our goal is to continue advancing sight saving treatments to make a lifetime of good vision a reality for everyone. The mission of the Retina Foundation of the Southwest is to prevent vision loss and restore sight through innovative research and treatment. The first day of vision research at the Retina Foundation of the Southwest was July 1, 1982 after a nation-wide search was conducted and Dr. David Birch, from Harvard, and Dr. Eileen Birch, from Massachusetts Institute of Technology (MIT), were hired on as our first Scientific Directors. Drs. Birch have dedicated their lives to conducting sight-saving research. Since 1982, the Retina Foundation of the Southwest has made many ground-breaking discoveries for the way the world understands, prevents, and treats vision loss caused by age-related macular degeneration, pediatric eye conditions, and inherited eye diseases. We discovered that DHA in mother’s milk is necessary for infant eye and brain development. Now, enhanced formula containing DHA is sold worldwide. We transformed surgical practice through our discovery that congenital cataracts must be removed during the first weeks of life to enable normal vision and brain development. Our home vision test and iPhone app, called myVisionTrackä, has the potential to prevent vision loss for seniors by providing a method for ophthalmologists to remotely monitor their patients in between appointments. The Argus II Retinal Prosthesis System helps patients who are blind due to advanced retinitis pigmentosa. When using this “bionic eye” artificial retina, they are able to distinguish letters, objects, trees and much more. With the help of an endowment from T. Boone Pickens, the Retina Foundation was able to expand research on age-related macular degeneration. In 2009, Dr. Karl Csaky, was named the T. Boone Pickens Senior Scientist and Director of the Molecular Ophthalmology Laboratory. Our research has found more effective ways to detect and treat “lazy eye” (amblyopia) in young children. The Pediatric Vision Scanner directly assesses misalignment between the two eyes instead of risk factors, which can lead to misdiagnosis. Playing binocular iPad games and watching binocular videos is a quicker and more effective treatment for lazy eye than the standard treatment of patching the fellow eye. The Southwest Eye Registry at the Retina Foundation is the only depository of DNA samples for genetic eye diseases in the southwest. This work has led to the discovery of a number of genes that cause eye disease. We conduct research in Dallas, Texas and work with partners across the nation and around the globe. Our discoveries advance eye care worldwide.